When this opportunity hit my inbox, I knew I had to participate. I'm kind of obsessed with hummus. I had never had it until I moved to Canada and I guess I've been making up for lost time ever since! The challenge was to get the ingredients to make the three appetizers that Abbey Sharp made in her video (embedded below!) and recreate them. I actually already had a lot of the ingredients on hand, so I was off to a good start! In Abbey's video, she made: Sweet Potato Chips, Pizza Twists, and Zucchini Fries. 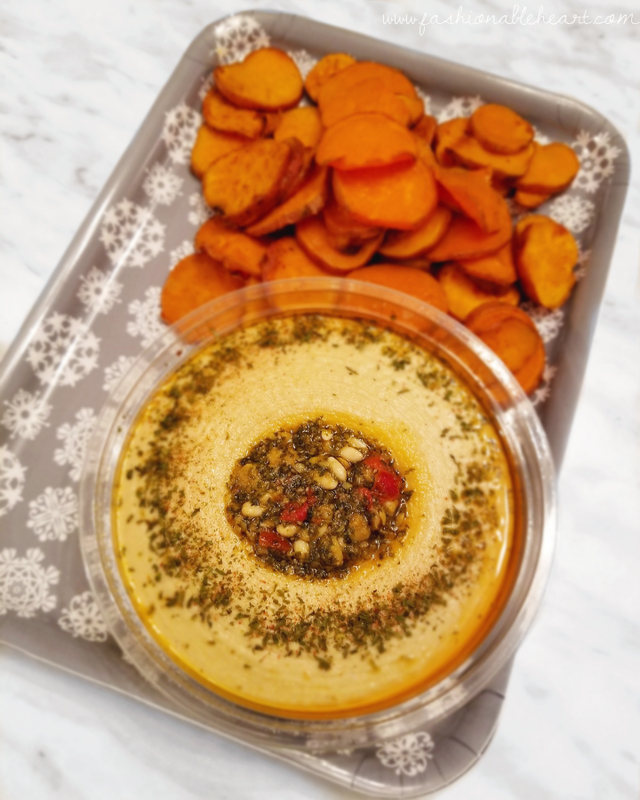 See more about the three recipes below, which Sabra hummus dip is the perfect pairing, and how I altered them a bit to fit my tastes! 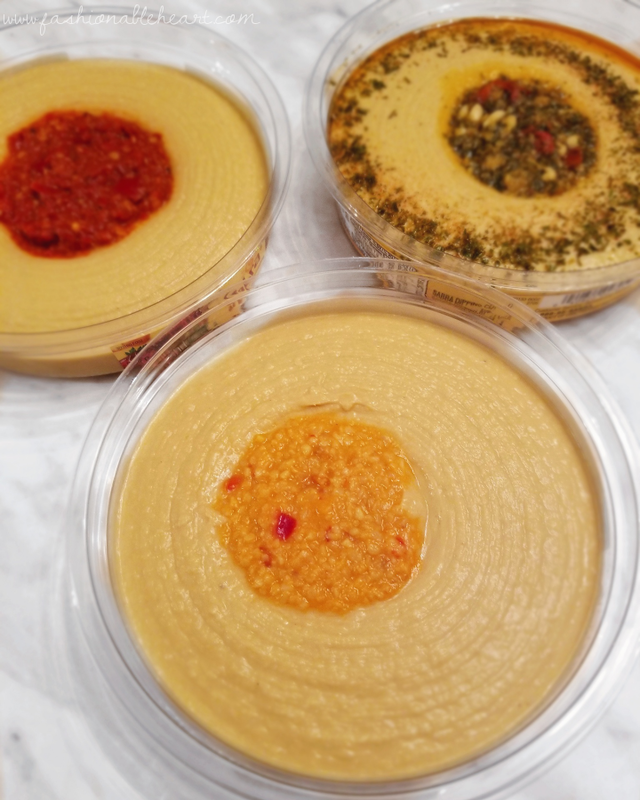 The three appetizers called for Sabra's Roasted Pine Nut hummus, Roasted Garlic, and the Supremely Spicy hummus. The Roasted Garlic is my personal favorite, but the other two were new to me. I think I have another favorite to add to my roster with the Roasted Pine Nut. So good! I made all three recipes in one go and it took about an hour, so these would be perfect for your next holiday party. I'll go ahead and let the cat out of the bag and say that my husband and I both enjoyed the pizza twists the most. We're totally pizza people! They were all delicious, but the pizza twists were gone before anything else. I'm surprised I didn't walk in to find my husband licking the plate clean. Because it was just us, I did only make enough for two people this past Meatless Monday. These would definitely be easy to up the amount! It's also worth noting that these pairings worked well together, but you could switch any of them around and you'd still have a winning combination. Those pizza twists in the Roasted Pine Nut? Yum. The sweet potato chips in the Supremely Spicy? Equally yum. With the sweet potato chips, I was reminded of one big thing I always forget. I need a darn mandoline slicer in my life. Note to self! I didn't change anything about this recipe and it worked out perfectly. In twelve minutes, you have a healthy snack or appetizer ready to be devoured. 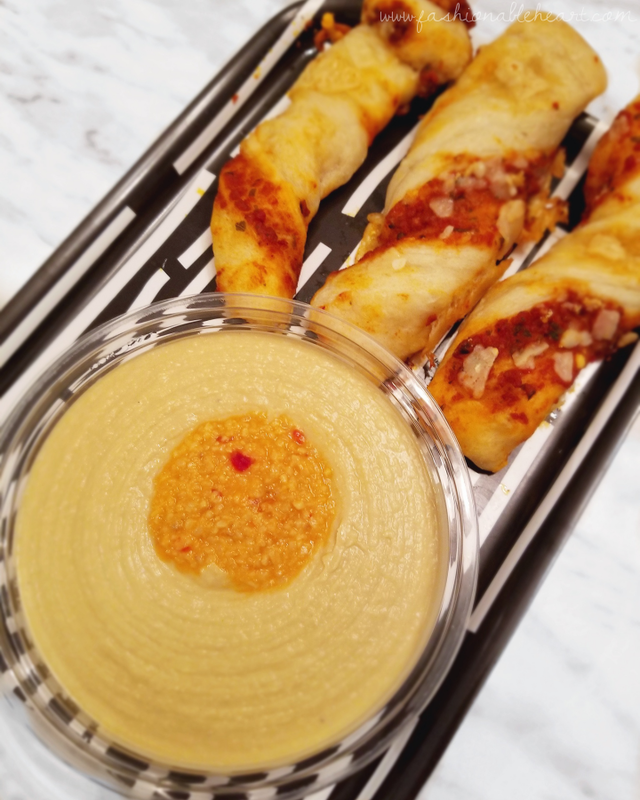 The beloved pizza twists! I will be making these again for sure. This was my first time doing the twisting technique. The first ones I put on the pan were not pretty and therefore did not make the picture. Sorry little twists, you were still delicious! I started to get the hang of it as I went. I did omit the red pepper flakes, as I don't like them. And on that same note, I replaced the green basil pesto (not a fan!) with a tomato pesto. This worked out really well, because it mimicked a traditional pizza sauce. These were ready in about ten minutes, which is about how long they lasted on the tray. 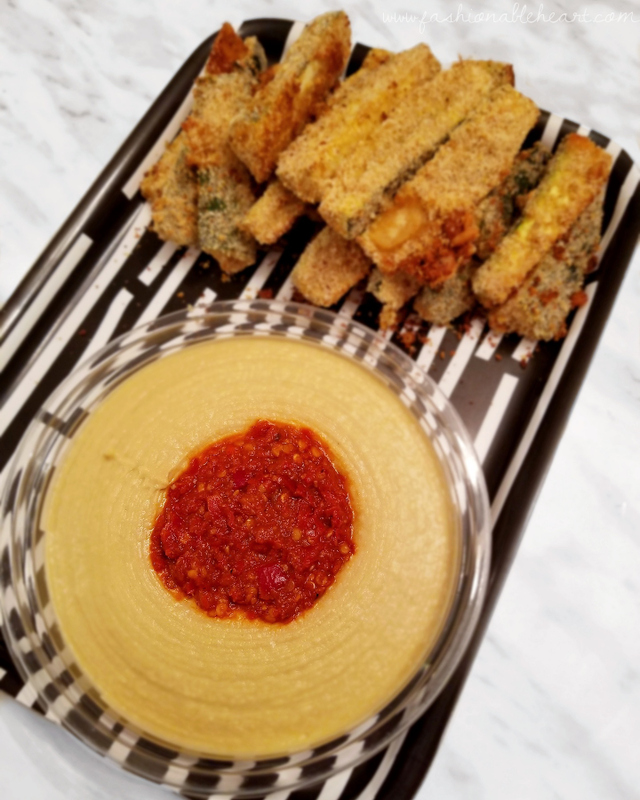 And that brings us to the Rosemary Zucchini Fries. I left out the rosemary because it messes with my stomach, but they were completely fine without it. If you're a rosemary fan, I can see that being a delicious addition in the coating. These are baked instead of fried and super easy to make. I have a thing about touching eggs, so I used a fork to get the zucchini from the egg, to the crumb mix, to the pan. Easy peasy. After 20 minutes, appetizer number three of the bunch was good to go. So which of these would you try? All of them? Because I say you should. You definitely should. Abbey put together some amazing and quick appetizers that I know I'll be making again. They are going right into my recipe binder! 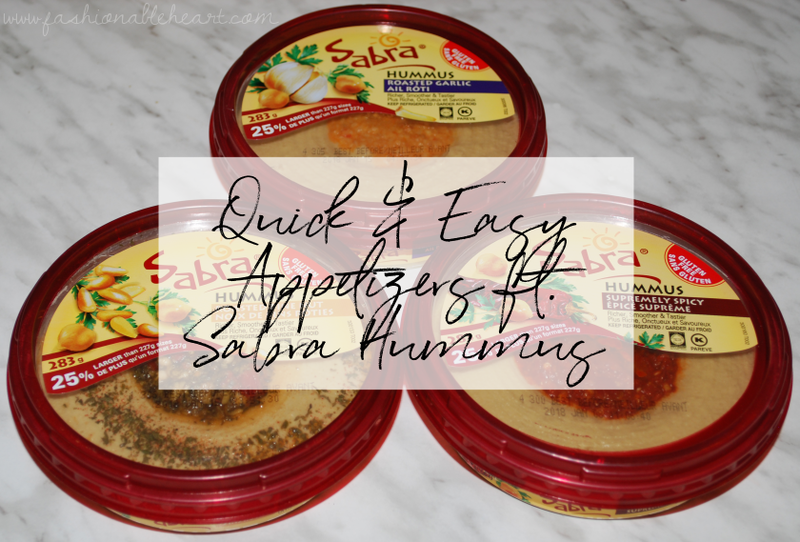 **The Sabra dips were provided, but I purchased the other ingredients. All pictures and thoughts are my own. There are no affiliate links in this post.